I’ve come across a wonderful contradiction built into technology, which sends us back unexpectedly to a much earlier time. I recently had a conversation with a friend. He’s 22 and when I told him I’d just received a wrist watch as a gift he looked at me blankly, so I raised my wrist to show him. “Oh,” he said, “I’ve never owned one.” He waggled his iPhone at me. “My friends and I all use this.” He tapped the front of his phone and the time popped up. He grinned and shrugged. Clearly it didn’t matter. Or the phone never left his hand. Or it hadn’t occurred to him because he’d never done it any other way. Doesn’t that seem like a giant step backwards in time (no pun intended)? Pocket watches required a hand to operate, too. You’d take the watch and chain out of your pocket, or lift it from where it dangled on your vest or blouse to check the time, which removed that hand from effective use for anything else. In fact, early wrist watches were popularized in the 1920s by a French sportsman who needed both hands free to operate (I kid you not) his hot air balloon. Wrist watches mark a significant milestone like high school graduation or bar mitzvah, not simply because they mark time–which is the essence of accomplishment–but because their daily usefulness and long life are continual reminders of the occasion. They’re built for permanence, symbolic of the giver’s lasting affection. I still have the gold wristwatch my parents bought me when I passed a sort of pre-college examination called the Eleven-Plus. I’ve taken care of it over the years, have replaced the band and the crystal after a mishap and still wear it occasionally. Every time I see it I’m reminded that my mom and dad presented me with the watch the night before the exam results were posted, touching evidence of their faith in me. Smart phones don’t have that kind of permanence built into them; in fact their 18-month replacement cycle is the price we pay for having the latest and best technology available. I guess you could frame one and hang it on the wall as a souvenir of the giver and the occasion, but a reminder of useless and superannuated technology doesn’t have the same emotional resonance or symbolic meaning somehow. I wonder if we’re about to see the re-emergence of street clocks? You still see them occasionally in older downtowns. Back in the day (and I mean really back), large up-market stores and banks erected big clocks on the front of their buildings or on the sidewalk outside so people who had their hands full of purchases or briefcase and such could see the time without having to dig in their pockets for their watches. Maybe watch chains will make a come-back, too. 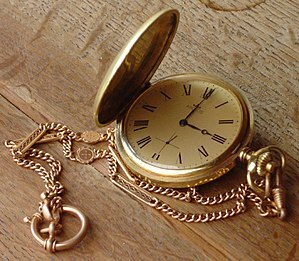 Pocket watches used to be attached to gold or silver chains which were then attached via a toggle to the owner’s clothing. They saved the watch from hitting the floor if it was dropped, prevented a pick-pocket from stealing it and—through pretty fobs and charms—acted as jewelry. Given that an iPhone is also threatened with all these things, maybe we’ll soon be seeing the re-emergence of gold chains for them, too. I love my new wristwatch because it looks sleek and it tells the time and it is a reminder of someone I love. And smart phones are great, too. Setting aside the problem of what to buy your graduate, I’m now completely enamored of a piece of 21st century technology that throws us back in time to the 19th century. Note to self: Remember to make sure Millennial characters are wristwatch free. Well said, Sue. It is a pain in the A@@ to have to find your IPhone every time you want to know what time it is. A watch is much better, easier to carry, doesn’t take either of your hands to look at it and can be a status symbol if you’re into that sort of thing. Good writing, as always. I forgot about the status symbol thing – watches really are multi-purpose!